Another great product from Magnoli Clothiers! 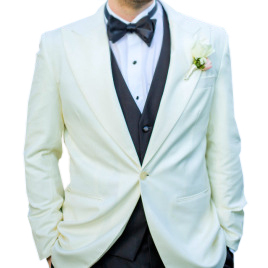 When I recently had to attend an event in a tuxedo, I knew the Shanghai Tuxedo was the one for me! Not only was it of the highest quality in all aspects but it also fit perfect as if I was fitted in person. The attention to detail was astounding, ensuring a stylish 1930?s look. I was the best dressed at the event and I owe it all to Magnoli Clothiers and this wonderful tuxedo.